Slow Cooker Red Beans and Rice are a smoky, spicy Louisiana staple. Full of Andouille sausage, ham hock, creole Cajun spices. 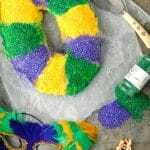 Fit for Mardi Gras or any day! I can’t think of any better food I love better than honest, country-style food. With a stick-to-your-ribs spiciness, these Louisiana Slow Cooker Red Beans and Rice are no exception. 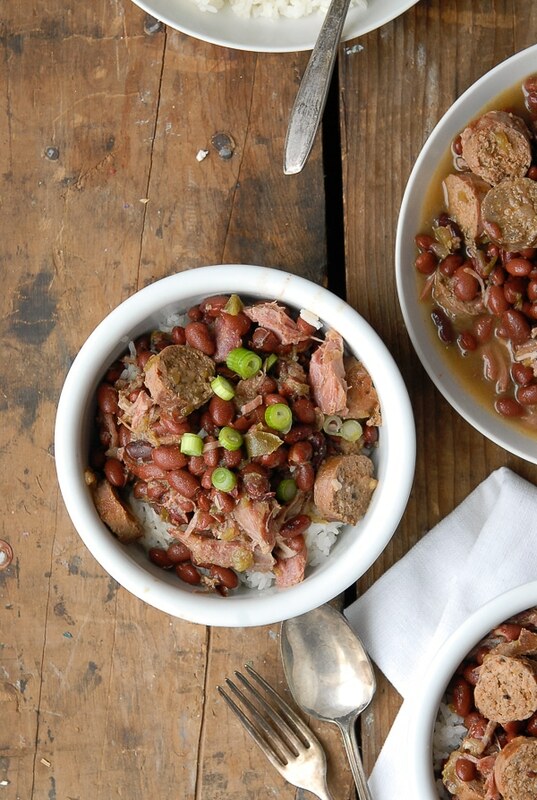 Though a simple recipe, Louisiana Red Beans and Rice are all but ordinary. 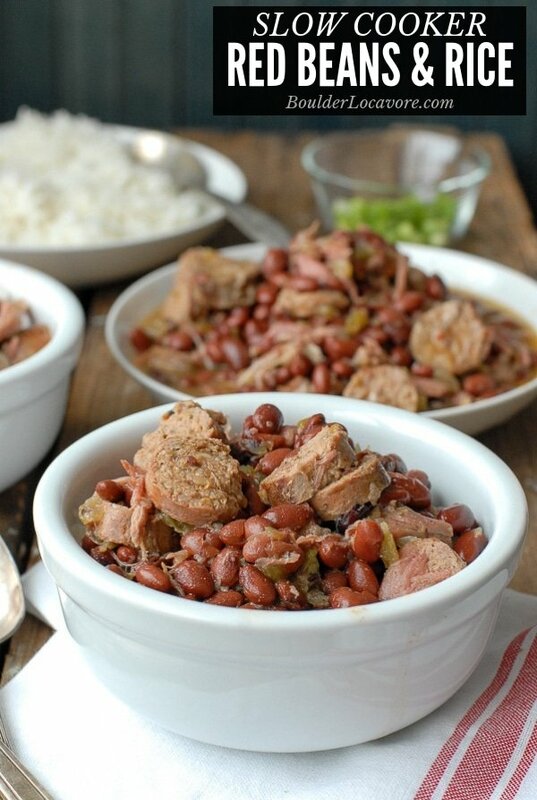 Full of robust creole spices, smoky Andouille sausage, ham hock, the recipe is soulful comfort food all the way. Whether celebrating Mardi Gras or warming up in the winter months, this classic dish is one you’ll want to make often. Like any classic recipe, there are many variations locally representing family traditions. Red Beans and Rice is a ‘Monday dish’. Traditionally served on Mondays using leftover vegetables and ham from Sunday dinner. 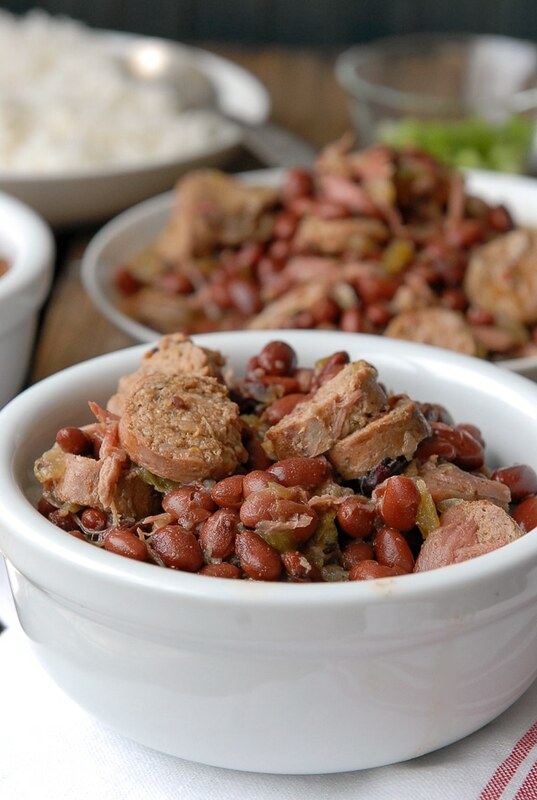 Typically the beans include sausage, with Andouille being traditional. It adds a smoky, spicy layer to the beans. Some recipes call for ham hock instead or in addition to the sausage making the beans irresistible in my book. Red beans and rice are each cooked separately. Creole spices further differentiate this dish from other similar bean recipes, giving it more of a kick and a signature flavor. Are Red Beans the same as Kidney Beans? No they aren’t. Red beans are smaller and rounder than kidney beans (though they are both red). The flavor is similar enough that if you cannot find canned red beans (they will be called that on the label), kidney beans may be substituted. 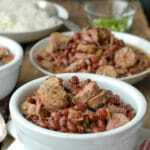 Unlike the traditional recipe, this red beans and rice recipe is made in the slow cooker (the bean portion). This allows all the ingredients in the beans to cook together, simmering for hours filling your house with irresistible aromas. Canned red beans are also used to save time rather than cooking dried beans. Using the slow cooker ensures great flavor! TIP: to make the ingredient preparation go faster, I use a mini chopper to chop the vegetables. Because you ask, this is the slow cooker I use. Since I am already cooking the red beans in a slow cooker, I usually cook the rice in a rice cooker or my Instant Pot. Then I don’t have to watch pots on the stove. If you use an Instant Pot, use this rice recipe; just do not add the cilantro and lime at the end (and you’ll have perfect cooked plain white rice)! For my recipe I included Andouille sausage which is widely available at most grocery stores, as well as a ham hock. Brown the sausage in a large non-stick skillet and set aside; retain any pan drippings. In that same pan saute the onion, celery, bell pepper and garlic for 1-2 minutes; allow them to absorb any pan drippings from the sausage. Add the vegetables to the slow cooker. Layer the browned sausages, ham hock and red beans. Sprinkle on the creole seasonings. Cook on LOW heat for 6 hours or until the ham is coming off the bone. Remove the sausages, cut into slices and add back to the slow cooker. Remove any ham from the bone; add the ham back to the slow cooker and discard the bone. Whether for Mardi Gras or any day, this recipe is soul-warmingly delicious. How to Store Red Beans and Rice? Store any leftovers of the Red Beans and Rice in a tightly sealed container in the refrigerator for 3-5 days. I recommend keeping them separate and combining when heating a serving in the microwave. Red Beans and Rice freezes very well! After the beans have fully cooked, allow them to cool slightly. Place desired amount into a freezer-safe container or bag, leaving 1/2-inch room on top (‘head space’) for expansion. May be kept in the freezer for up to 6 months. Rice: Thought it is possible to freeze the rice, I recommend making a fresh batch of rice after thawing the beans for the best result. Remove from the freezer and allow to thaw completely in the refrigerator (preferred method). Reheat fully and serve over freshly prepared rice. Whether celebraing Mardi Gras or warming up in the winter months, this classic dish is one you'll want to make often. In a large non-stick skillet, brown the sausage over medium-high heat and set aside. Note: if a non-stick skillet is not available, warm the olive oil first and brown the sausage. Retain pain drippings. If not already used above, warm the olive oil in the skillet again over medium-high heat. Add the onion, celery, bell pepper and garlic to the skillet and sauté for 1-2 minutes to soften slightly and pick up the pan seasonings from the sausage. Place into the bottom of the slow cooker. Place the browned sausages on top of the vegetables followed by the ham hock. Sprinkle the creole seasoning on top and pour in the chicken stock. Cook on LOW for 6 hours until the ham is coming off the hock. Scrape any ham off the hock; place ham back in the slow cooker and discard the bone. Remove the sausages, cut into slices and place back into the slow cooker. Serve over the prepared rice. Originally published February 17, 2015. Updated February 2019. I loved the way this turned out! Delish! You’re a mind reader, I so wanted these today, thanks for a delicious recipe! I love red beans and rice – and this recipe was a total knockout! 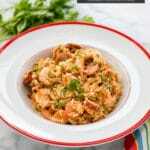 This recipe took me right back to New Orleans! SO much flavor in every bite! This has become a Mardi Gras tradition!!! I could eat this beans and rice all the time. LOVE! I love how flavorful this recipe is! Such an easy weeknight dinner. I’m always up for using my slow cooker to help get dinner in the table! Love how budget friendly this meal is too. This looks incredibly delicious!! I LOVE the flavors!! I love red beans and rice, I always make is a simple way, I will be trying this recipe soon though. Looks so good! We went to New Orleans a couple years back and I had classic red beans and rice. When I ordered it, I had no idea what a treat I was in for. I have been craving it ever since. I have to tell you when I saw your post, my eyes (and my taste buds) lit up. 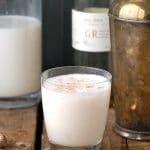 I am elated to see this recipe. I can’t wait to try it. Thanks Toni! Oh Donna that makes me so happy! The smoky, sultry spice of Andouille sausage and ham hocks really aren’t like anything else, and of course some Creole seasonings thrown in. I could eat this every day I think. I hope if you do have the chance to try it you’ll have many happy memories come back to you! OMGosh – get out of my head! I swear I was just dreaming of this recipe this morning. That is so weird! I can literally taste this, because it’s been in my head all day! Looks delish! Well now you don’t need to dream; throw the ingredients in your slow cooker and voila! I’m not even hungry, but this looks SOOO good, my stomach is growling and I’m printing out the recipe to make as soon as I can get to the store. Thank you for the inspiration and keeping us Southwesterners in touch with what’s going on around the world. Don’t you love food like this? I think rustic, country fare is my all time favorite. Unpretentious, loaded with flavor. It just feels authentic. I would happily eat this for any meal of the day! I agree on the slow cooker Carrie. I love the chance to put things together and forget them knowing they’ll turn out as delicious as if they were made on the stove top! We all need recipes like this to swap into our repertoire, right? Red beans and rice is one of my husband’s favorites – love how you’ve transformed it into a slow cooker recipe! Secretly Melanie I love anything I can turn into a slow cooker recipe without compromising the integrity of the dish. I think your husband would love these; they are smoky, spicy with deep flavor. 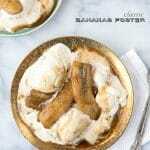 This recipe reminds me of my childhood! My mom used to make red beans and rice every year for Mardi Gras. She used kielbasa sausage in hers, I’m sure to spare me and my sister from all the spiciness. However today I can’t get enough spicy food in my life and would definitely use andouille. Looks fantastic! I get the feeling Andouille is also not easy to get everywhere. Fortunately with Whole Foods being so common it’s available there. I think some prefer a less spicy version too but that’s the part I can’t get enough of! 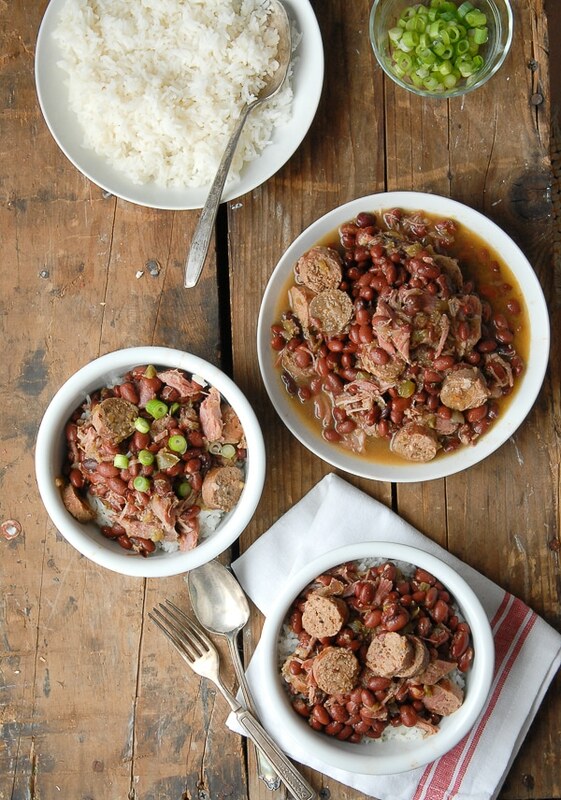 I love red beans and rice, and this recipe looks awesome, as do your photos! Thank you Michelle and I agree on loving beans and rice. Could eat them at every meal. You hit the nail on the head Heather about celebrating at home. These beans are really authentic tasting and it brings Mardi Gras to YOU regardless of where you live. I could eat them every day.